One size: fits approx head circumference of 21 - 24 inches (53 - 61 cm). 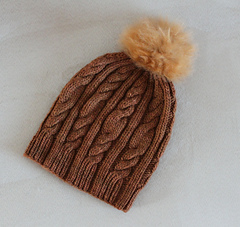 Closely related to the Bestie Beanie, this slouchy version is achieved with a slight change to the brim pattern and the addition of increase stitches before the body begins. 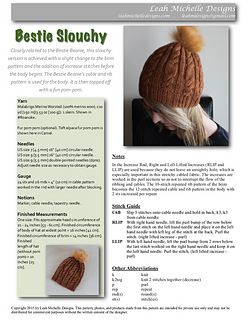 The Bestie Beanie’s cable and rib pattern is used for the body. It is then topped off with a fun pom-pom. This pattern is worked in the round from the bottom up. 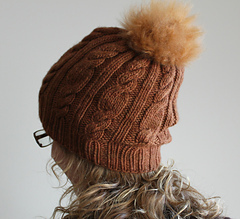 The Bestie Slouchy requires one skein (or approximately 200 yards) of worsted weight yarn. Pattern includes notes, stitch guide, list of abbreviations, and the stitch pattern is both written and charted. One size: Fits approximate head circumference of 21 - 24 inches (53 - 61 cm). Finished circumference of body of hat at widest point = 16 inches (41 cm). Finished circumference of brim = 14 inches (36 cm). Finished length of hat (without pom pom) = 10 inches (25 cm). Skills required: knitting in the round, increasing, decreasing, cabling with a cable needle. Stitches used: k, p, RLIP, LLIP, C6B, k2tog. This site has great instructions, with photos, for the Right Lifted Increase - Purl (RLIP) and the Left Lifted Increase - Purl (LLIP): www.knotions.com.